SCOTTSDALE, AZ--(Marketwired - November 16, 2017) - TriStar Gold Inc. ("TriStar" or the "Company") (TSX VENTURE: TSG) is pleased to provide the following corporate update with respect to its development activities at its Castelo de Sonhos gold project in Brazil. On September 13, 2017, the Company announced an independent mineral resource estimate completed by CSA Global Inc.("CSA"). This resource estimate calculated inferred mineral resources (at 0.4 g/t cut-off) of 31 million tonnes grading 1.3 g/t containing 1.3 million ounces of gold. This resource estimate did not include assays from the last 37 drill holes as these assays were not available at that time. The Company has now received all assays from the final 37 holes of the 2017 reverse circulation drill program and intends to publish an updated mineral resource before the end of the year. 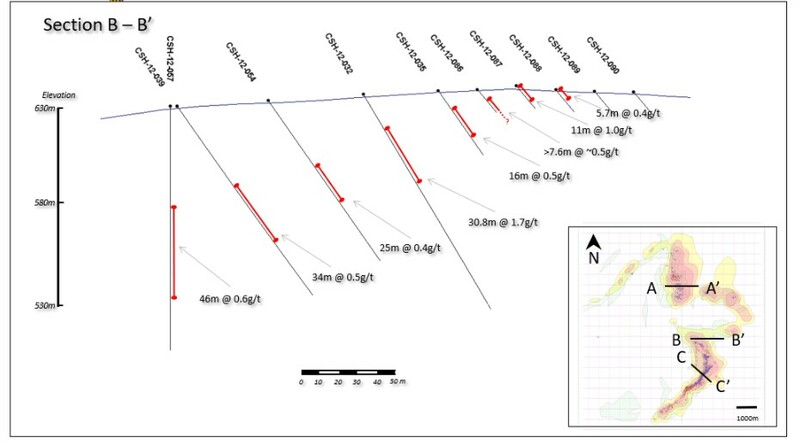 The results from the last 37 drill holes are generally consistent with previously received assays. In total, the 2017 reverse circulation drill program consisted of 133 holes totaling 15,019 meters in the Esperança South and Central areas. 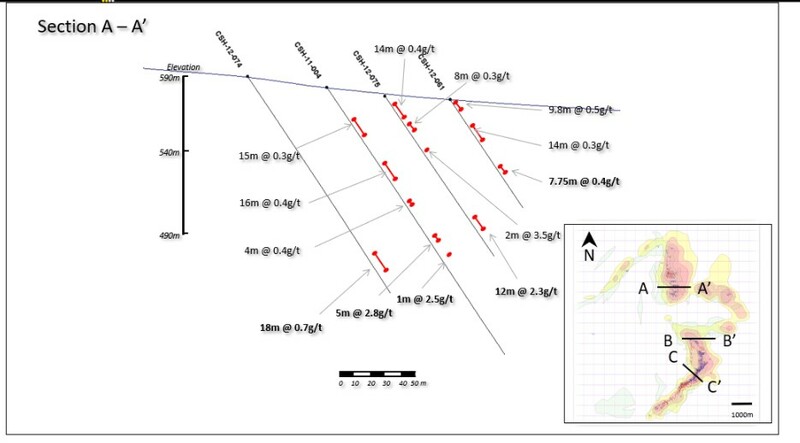 Drill cross-sections are attached showing the mineralization in various parts of the deposit. Nick Appleyard, President and CEO of TriStar commented "Since last year, we've been using our analysis of the exploration target range to guide our work on this project. More than a hundred new drill holes and a new independent resource estimate confirm that our ETR models work well in that they have provided reliable predictions for resource growth in the areas drilled this year. The ETR models have played a big role in getting us to where we are now, with a significantly expanded resource; and we're looking forward to seeing how well they continue to work with the upcoming resource update, and with further drilling and resource development next year." Subject to available financing, in 2018 the Company plans to continue its drilling on the CDS property with the objectives of both expanding the resource estimates and increasing the confidence in those estimates. The Company anticipates completing a Preliminary Economic Assessment of CDS by mid-2018. TriStar's Vice-President, R. Mohan Srivastava (P.Geo) is the qualified person for this press release and has prepared or supervised the preparation of the scientific or technical information in this press release. TriStar Gold is an exploration and development company focused on precious metals properties in the Americas that have potential to become significant producing mines. The Company's current flagship property is Castelo de Sonhos in Pará State, Brazil. The Company's shares are listed on the TSX Venture Exchange under the symbol TSG. Further information is available at www.tristargold.com. Certain statements contained in this press release may constitute forward-looking statements under Canadian securities legislation which are not historical facts and are made pursuant to the "safe harbour" provisions under the United States Private Securities Litigation Reform Act of 1995. Generally, forward-looking information can be identified by the use of forward-looking terminology such as "expects" or "it is expected", or variations of such words and phrases or statements that certain actions, events or results "will" occur. 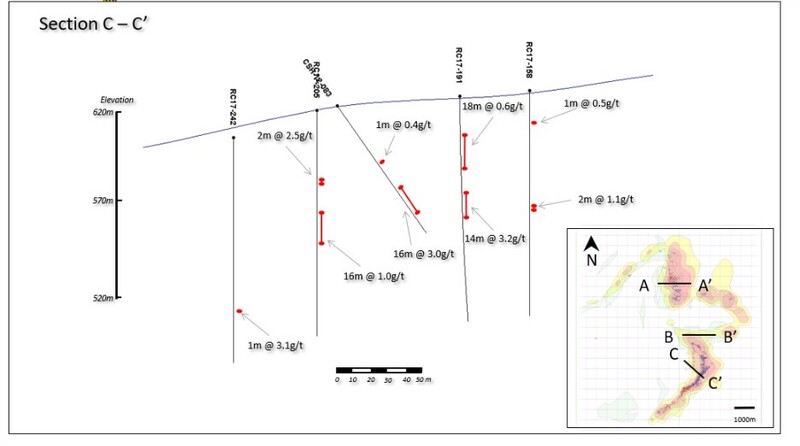 Forward looking statements in this press release include, the scope and success of the planned exploration program at the Castelo de Sonhos project and the Company's opinion that it has clear title to the Castelo de Sonhos property. Such forward-looking statements are based upon the Company's reasonable expectations and business plan at the date hereof, which are subject to change depending on economic, political and competitive circumstances and contingencies. Readers are cautioned that such forward-looking statements involve known and unknown risks, uncertainties and other factors that may cause a change in such assumptions and the actual outcomes and estimates to be materially different from those estimated or anticipated future results, achievements or position expressed or implied by those forward-looking statements. Risks, uncertainties and other factors that could cause the Company's plans to change include changes in demand for and price of gold and other commodities (such as fuel and electricity) and currencies; changes or disruptions in the securities markets; legislative, political or economic developments in Brazil; the need to obtain permits and comply with laws and regulations and other regulatory requirements; the possibility that actual results of work may differ from projections/expectations or may not realize the perceived potential of the Company's projects; risks of accidents, equipment breakdowns and labour disputes or other unanticipated difficulties or interruptions; the possibility of cost overruns or unanticipated expenses in development programs; operating or technical difficulties in connection with exploration, mining or development activities; the speculative nature of gold exploration and development, including the risks of diminishing quantities of grades of reserves and resources; and the risks involved in the exploration, development and mining business. Although management of the Company has attempted to identify important factors that could cause actual results to differ materially from those contained in forward-looking statements or forward-looking information, there may be other factors that cause results not to be as anticipated, estimated or intended. The Company disclaims any intention or obligation to update or revise any forward-looking statements whether as a result of new information, future events or otherwise, except as required by applicable securities laws.